NEW BRUNSWICK, NJ:– World-renowned equine personality, professor and former mounted patrol horse, Lord Nelson, passed away on April 12 at Gales Way Farm in Wrightstown, New Jersey. Lord Nelson, who will be remembered as Rutgers University’s only equine professor emeritus, lived a distinguished life, full of adventure, up until the ripe age of 42 (the human equivalent of 126 years). Lord Nelson was purchased in the summer of 1978 from Roosevelt Sales Stables in Edison, New Jersey. Believed to be five years old at the time and from a Quarter Horse ranch in Oklahoma, Nelson was selected as one of the first horses that would make up the Mounted Patrol unit of Rutgers University Police Department. He commuted to New York City daily to train with the New York Mounted Patrol and finished the program in the fall of 1978. His personality is one that Karyn Malinowski, director of the Rutgers Equine Science Center and faculty member in the Department of Animal Sciences, says was “one-of-a-kind.” She remembers one night working late in Bartlett Hall on the Cook campus and all of a sudden hearing a fast-paced gallop coming from the road. Upon looking out the window, she saw Lord Nelson, who remembered to “walk” on the sidewalk and not the street, going back to his stable on College Farm Road followed by a police officer, on foot, in hot pursuit. Apparently he wanted to end his shift early that night. Lord Nelson will also be remembered as the first, and only, horse to ever receive an official football penalty in a NCAA football game. In addition to his time with the student mounted patrol, Nelson also served as the horse that was ridden by the Scarlet Knight at Rutgers football games. During a close game against Army in 1994, Nelson broke onto the field and raced all the way down the sideline to the opposite end of Giants Stadium. Receiving a yellow flag for his “un-sportsHORSE-man like conduct,” he almost cost Rutgers the game. Lord Nelson retired from Rutgers in 2000, moving to Gales Way Farm to be cared for by a former Rutgers mounted patrol student, Wendy Gale-Hale (class of ’89). After nine years, the Equine Science Center brought him out of retirement to be the figurehead of Equine Science 4 Kids. Started in 2009 as a campaign to educate animal farmers in NJ about the Animal Waste Management Rule, the “Scoop on Poop” campaign worked to help farmers comply with the impending rule. As an advocate for environmental stewardship on horse farms, Nelson was once again in the spotlight. 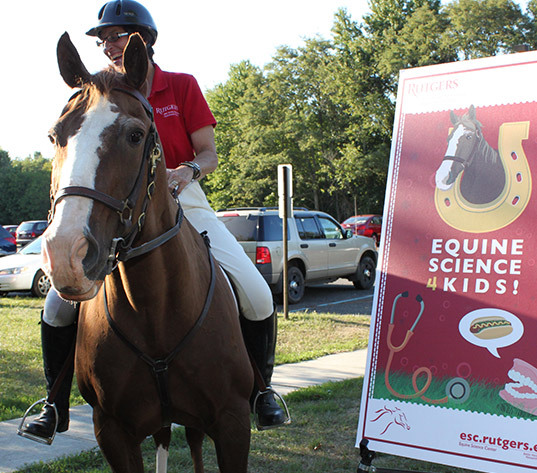 The Equine Science 4 Kids portal was launched in 2010 as a fun and educational space for kids to learn about horses. A companion blog was also created where Lord Nelson would teach kids about the science of horses. Once again Lord Nelson was “working” for Rutgers as a professor emeritus, focused on educating young people. Most recently, Nelson received the “Horse Personality of the Year Award” from the New Jersey Equine Advisory Board for all his years of hard work. This award signifies a cornerstone in his life and a fitting way to remember an equine professor, mounted patrol horse and collegiate football legend. Nelson is survived by his “mom” Karyn Malinowski and equine pasture-mate Hugme Christi. A memorial research fund has been set up in his name to further “old horse” research at Rutgers. The Lord Nelson Older Horse Research Fund will further the research that kept him going for 42 years. Questions about how to donate can be emailed to esc@aesop.rutgers.edu or inquiries can be made by phone at 848-932-9419.